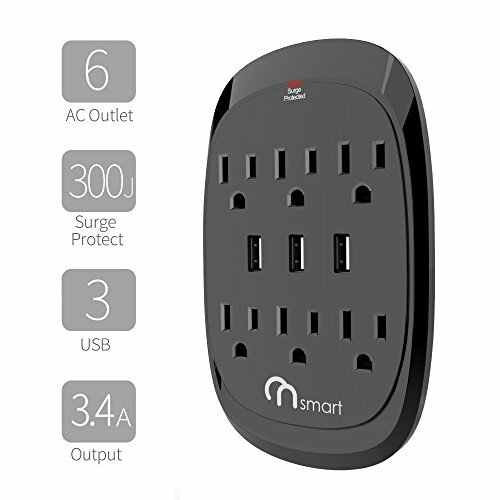 Hosting at the same time up to 9 devices, it makes a high-end computer, refrigerator or TV surge protector, EASY TO PLUG IN and PORTABLE on all your out and about. The SMART SPACE-SAVING design with the DAMAGERESISTANT housing and the dust-proof port door ensures circuit protection from IMPACT and DUST, while the IC multi-protection saves you from SHORT-CIRCUIT, OVER-CURRENT and OVER-HEATING problems. 15A x 115V that provide 1875W max power for your Home AV center, TV, sound bar, game counsel etc. It can also support your Home office equipment such as PC, monitor, printer, router etc. It is also perfect for floor lamp, heater, fan, vacuum and other home appliances. 17W / 3.4A total output are able to charge multiple phones, pads, tablets at the same time efficiently. You no need your large USB adapter anymore and save some space. Single ports max output is 2.4A. the indication light brightness is tuned down in purpose to reduce the unnecessary brightness that might interfere your good night sleep.